Every year I make our country’s National Anthem ‘come alive’ for my preschoolers. This is a hard song to sing, especially for children. They know the tune, and thanks to baseball on television and sporting events, “The Star-Spangled Banner” is familiar. Yet, there is so much more they need to know, never mind singing the song. 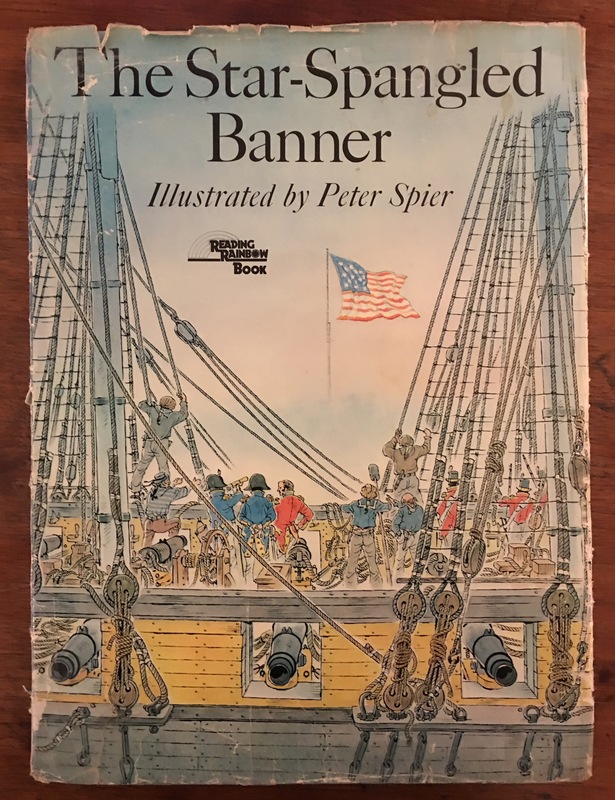 Way back when, I bought Peter Spier’s book, The Star-Spangled Banner. This started my quest, and gave me the perfect tool to teach, inspire, and instill pride. I remember the day I learned that America did not have an official National Anthem until the 1930’s. What! How could that be? I called my Mother and she confirmed this upsetting news. What did you sing when you were a little girl? Really? While this didn’t bother my Mother, it fueled me. It was the “GO” button, and I pushed it. I had Peter Spier’s book, The Star-Spangled Banner. Every page is a full color illustration of each sentence in the song. When I would read the book to children, instead of reading the words I sang the words. The words were the song itself, so singing them helped children link a familiar tune to what those words really meant. Every page became a lesson in history, and a barrage of questions. 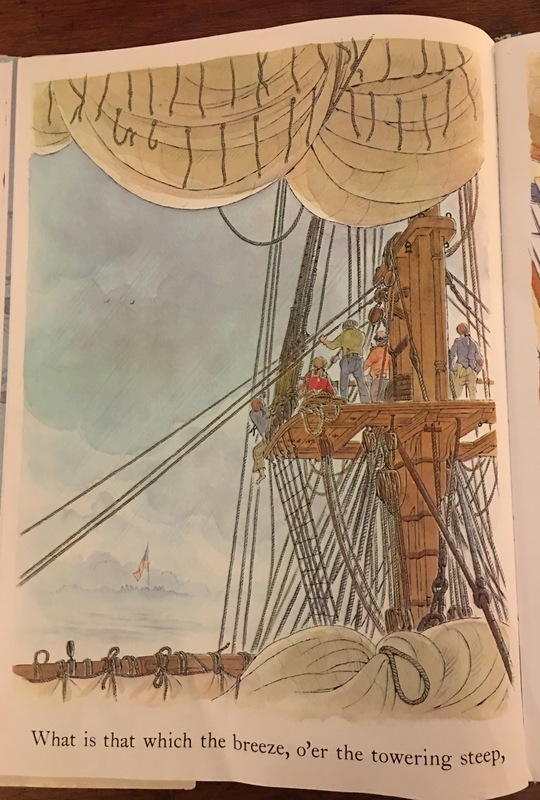 We stopped to talk about costumes, the sails of the ship, the rocket’s red glare. 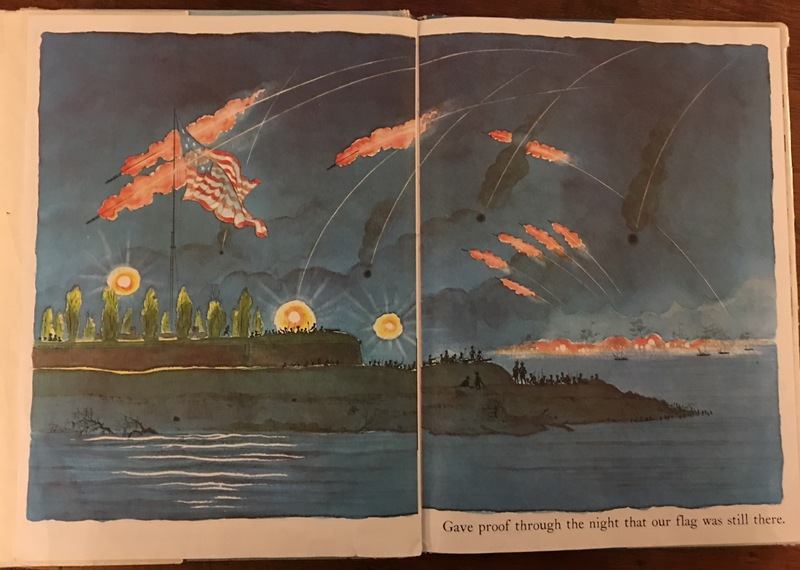 We found the American flag on every page. We learned that the rockets and bombs illuminated the flag. This is where I always stop singing and tell the story of Francis Scott Key as he wrote the song. Oh, now they get it! They understand. The illustrations are crystal clear and make perfect sense. More importantly, they understand the words to the song, our country’s National Anthem. Children know far more about this song than I knew as a child. I dearly wish I’d had a visual to help me understand. Pictures bring words to life. Like a ‘towering steep’. The book gets better, and so do the opportunities for learning. There is more than one verse! I sing those words as loud and proud as I do the first verse. Again, every illustration gives pause for talking and learning. Sometimes it is sad, and that is important to talk about. Oh, we talk about soldiers and dying, and freedom and liberty, and why. It always feels warm and understanding. A picture is worth a thousand words. When that happens with our National Anthem, “The Star-Spangled Banner”, the world of understanding opens and the song comes alive. 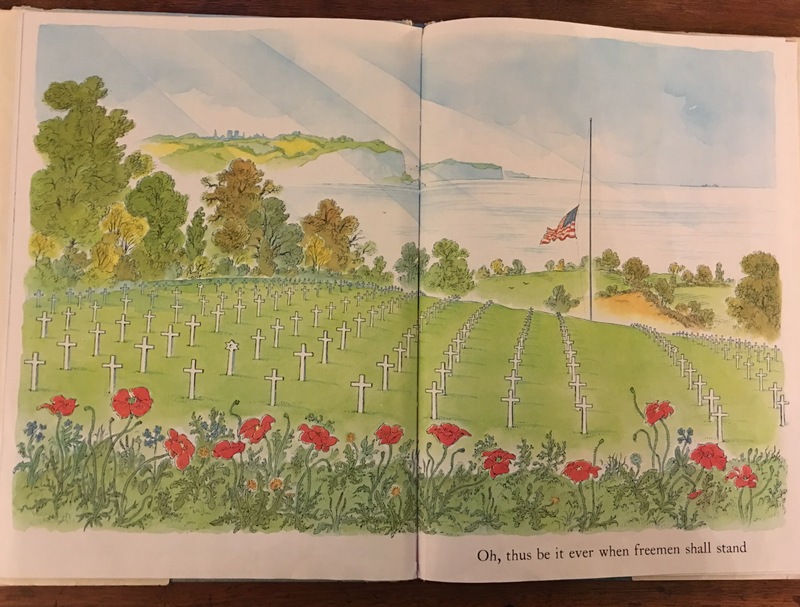 This entry was posted in Early Education, Learning About the World, military, patriotism, Peace, picture books, reading, Singing and tagged Fourth of July, history, National Anthem, patriotic picture books, patriotism, Peter Spier, Singing, teaching young children, The Star Spangled Banner. Bookmark the permalink. Such a wonderful post! I am struck- yet again -about how fortunate your students are to have you as their teacher! I love this book, Jennie! You keep all kinds of special traditions alive in your magical classroom which builds and fills young children’s curious minds! Thanks, Robin. Happy Fourth of July to you, too! This is a fine post, fitting for today! Happy Fourth of July. This is an excellent post, Jennie! What a fabulous teaching aid! Thank you, John. My one regret is that I never wrote to the author to tell him so. He died recently. Sad. Yet, the book and his story live on! I understand that regret, however, you are sharing his work in a way that would make him very grateful. How do you teach preschoolers to sing The Star-Spangled Banner? Jenny has the answer in this remarkable post by Jennie. In honor of the 4th of July, I pass this along for my American cousins. Please enjoy! Thank you so much for reblogging, John! You’re welcome – my pleasure, Jennie! What a blessing for your students. I too didn’t know the Star Spangled Banner was so new to us! That looks like an interesting book. I always think that your national anthem is such a difficult song to sing, but much more interesting than our dull ‘God Save The Queen’! I hadn’t thought of “God Save the Queen” as dull. That’s an interesting comment. The next time I hear the song, I’ll think about that. Best to you, Pete! It is dull, believe me. That sounds like a great book, Jennie. The words are hard to understand for kids (and adults). The story and pictures are wonderful. Happy 4th! Wonderful! Thanks for sharing…HAPPY INDEPENDENCE DAY! Many thanks, Jennie. I wish we had a book about the meaning of the words in Advance Australia Fair, especially ‘Our home is girt by sea’. I suppose being composed by a Scot in 1878, girt was a normal word. Not any more. I found Interesting info at https://en.wikipedia.org/wiki/Advance_Australia_Fair . Girt. That is so interesting, Glenice. Waltzing Matilda was a favorite song growing up. All the kids learned it. Yes, wouldn’t it be a wonderful book for Australians to have such a book! And Peter Spier who wrote this book was not an American. Wow! My regret is that I never wrote him a letter to thank him and to tell him how much his book has done for children. He died this year. Pen in hand, I will now be a champion of writing those words to others. Many thanks, Glenice. I have never been able to sing that song out loud. My throat closes up from the tears and emotion I feel. It’s so wonderful that you can explain the song to children in a way they can understand. Hope your 4th was happy. Me too, Marlene! I can hardly get past “Gave proof through the night…”. So glad you liked the post! Thank goodness I have the book. I understand, Sarah. It is the best way for children to learn. My one regret is that I never wrote the author to tell him how much his book has done for children. He died recently. I think I will find a way to write his family. It’s the right thing to do. Excellent post, Jennie. I did a similar one on my blog. WONDERFUL post about a wonderful book from a wonderful teacher. You may be keeping patriotism alive single-handedly. Hope your 4th was wonderful. LOVED GP’s “comment” and would have “liked” it had you enabled them. Thanks for sharing one of your many clever teaching techniques. Your students are fortunate indeed to have been taught by you. Awww… that is so nice, Madelyn. Thank you! Excellent way to bring the song alive for your students (I can just see you singing out the words). Hope you had a wonderful 4th, Jennie! Thanks, Marcia! A great Fourth with friends. Hope you enjoyed the holiday, too.